Chronic knee dislocations are fortunately not seen commonly, but when these injuries do present, they are typically a source of severe functional impairment to the patient. Surgical management may harbour further complications due to the extensive soft tissue release that is required, and the fact that significant deformities are corrected acutely. We report on a 32-year-old, HIV-1 infected, female patient 20 months after a dislocation of the left knee. 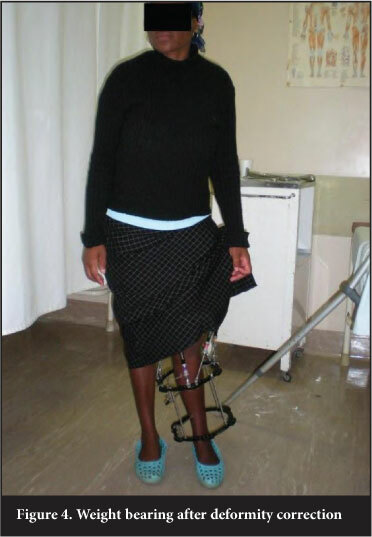 Due to the extent of her flexion contracture, she was unable to walk unaided. A Taylor Spatial Frame was applied across the knee, and gradual reduction of the dislocation, with correction of the knee flexion deformity, was performed over a period of 26 days. The final result produced a stable, ankylosed knee that allowed weight bearing without the need for any walking aids. No complications attributed to the reduction or the fixator was experienced, and no additional surgeries were required. We conclude that gradual reduction of chronic knee dislocations, using the Taylor Spatial Frame, provides a safe and effective method of treating these complex injuries without subjecting patients to extensive surgical soft tissue release procedures. Chronic knee dislocations are complex injuries and pose significant management problems. Not only are they the source of significant impairment but the surgical management may harbour further complications due to the extensive soft tissue release that is required, and the fact that significant deformities are corrected acutely. Fortunately these injuries are not encountered frequently, and only very few cases have ever been reported in the literature. While on an outreach visit to a rural hospital, we were presented with a 32-year-old female patient, 20 months after a left knee dislocation. The reason for the late presentation was not clear, and the patient could not give a clear history of an inciting event. At the time of presentation she had no pain, but was unable to weight bear due to the fact that she had a grossly displaced chronic knee dislocation. Her knee was fixed in flexion of approximately 80°, which necessitated the use of crutches for mobilisation (Figure 1). Regardless of this gross deformity, there was no vascular or neurological fallout. Of note in her medical history was the fact that she was HIV positive and on anti-retroviral treatment, regimen 1B, for three years prior to her presentation. She was in a good clinical condition, with a good nutritional status and no evidence of opportunistic infections or malignancies. 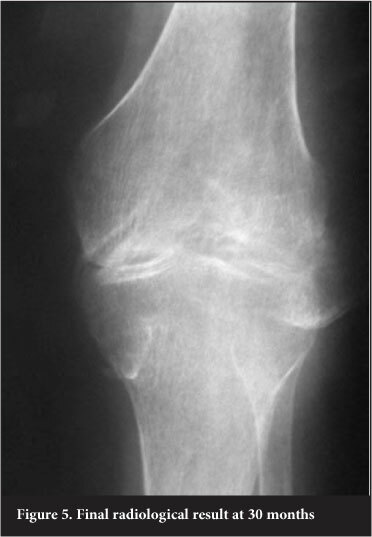 She was accordingly classified as a type B host.1 Following comprehensive clinical, biochemical and radiological evaluation the diagnosis of an old, unreduced traumatic knee dislocation was made. During our consultation, treatment options, possible complications and realistic goals were discussed, and the patient was satisfied with the prospect of a straight, anky-losed knee. A Taylor Spatial Frame circular external fixator (Smith and Nephew Inc., Memphis, TN, USA) was selected as the method for reduction. A CT scan with three-dimensional reconstruction was crucial in the preoperative planning to better understand the deformity (Figure 2). The CT scan also provided more accurate deformity parameters needed for the Taylor Spatial Frame software. Intra-operatively the external fixator was applied across the knee, with wide ring blocks to stabilise the construct and provide longer lever arms for the correction process. Correction was performed over a period of 26 days to allow gradual stretching of the posterior neurovascular structures during reduction (Figure 3). Due to the complexity of the deformity we elected to complete the correction on an inpatient basis. After the correction she was discharged home, with instructions on pin tract care. As soon as the position of the knee allowed weight bearing she was instructed to commence partial weight bearing with crutches. Rehabilitation continued as an outpatient, with the main focus on weight bearing and preventing hip and ankle joint contractures. The patient attended two weekly outpatient follow-up visits. She was observed for the development of any complications, and her progress with rehabilitation was monitored. 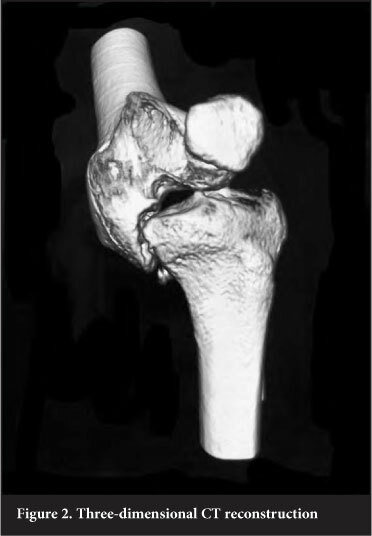 Full weight bearing was possible once reduction of the knee was achieved (Figure 4). The only complication was superficial pin tract sepsis of one of the femoral half pins. This infection was classified as a Checketts and Otterburn grade II infection and responded well to local pin tract care and oral antibiotics.2 No per-oneal nerve palsy developed during correction. 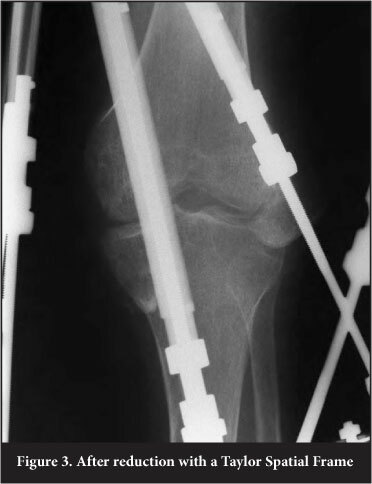 The external fixator was removed 9 weeks after the correction was completed, making the total length of external fixation 14 weeks. Over the following 30-month follow-up period, no complications were encountered and the patient was satisfied with the final outcome (Figure 5). Due to the severity of the flexion deformity and soft tissue contraction, treatment by utilising a Taylor Spatial Frame was chosen. This allowed gradual reduction without the need for an open procedure with extensive dissection.16 The Taylor Spatial Frame system enables the correction of complicated deformities with excellent precision without the need for modifications to the frame.17 This affords us the convenience of correcting a complex deformity with only a single surgical procedure. Pin tract sepsis is a very common complication with the use of ring fixators.18-21 Our patient developed a minor infection of one femoral half pin.2 Treatment consisted of pin tract care and oral antibiotics which resulted in complete resolution of the infection without any further sequelae. Gradual correction of grossly displaced chronic knee dislocations is effective in producing a stable, ankylosed knee joint following reduction. The use of the Taylor Spatial Frame provides a safe and accurate method of reduction without the need for extensive surgical exposures, minimising the potential for serious complications. The content of this article is the sole work of the authors. No benefits of any form have been received or will be received from a commercial party related directly or indirectly to the subject of this article. An ethical committee has approved the research.